I write middle grades fantasy and young adult paranormal romance. The Choice is the second book in The Sidhe series. For Calum Ranson, seventh grade brings changes in his relationship with his parents and his friends, and a confrontation with his bully. Calum’s talents have also developed to a level unheard of in the Sidhe world. In The Choice, Calum, Laurel, and Hagen reunite in their search for Finley. And while many things have changed, Calum remains steadfast in his belief that Finley is still alive and that Calum will bring him home. 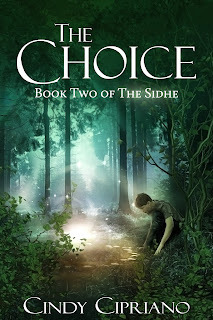 The Circle Book One of The Sidhe and The Choice Book Two of The Sidhe are both available in print and Kindle versions. Join a critique group and run your manuscript through the group. Pay attention to suggestions and comments then edit as you feel is appropriate. After all, it is your story. Donnelly Dunbar - no doubt. I love his intensity and devotion to his family. Oh, and the fact that he liberated himself from the darkest faerie clan of all. The Sidhe series is one that strikes a chord with adults and young adults. There are 68 reviews posted on Amazon, and all of those were written by adults. Fantasy readers of all ages will enjoy The Circle, The Choice, and the other books in The Sidhe series. I am currently writing the third book in The Sidhe series. In The Lost, Calum and his friends are in the 8th grade, and the stakes are getting higher. I like to include real places in my stories (Fairy Stone Park, VA in The Circle, the Brown Mountain, NC in The Choice). The Lost has an equally mysterious and factual setting.